Are your lift chairs covered by any sort of warranty? 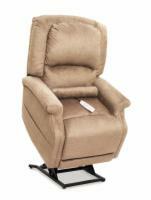 We offer a free 1-year warranty which covers in-home service of your lift chair recliner with all purchases. You may also purchase extended warranty coverage on any lift recliner. In addition, a manufacturer's warranty may also cover your purchase; for more information, visit our warranty page. What happens when I need repairs or service on my lift chair? Both Pride lift chairs and Golden lift chairs come with a full manufacturer warranty plus a one year in-home service contract. This means that parts and labor on any repairs are free for the first year from the date of purchase. If you need service, please call toll-free service number supplied with your lift chair. A technician will be scheduled to come to your home and repair your lift chair. Are there any hidden charges when I purchase a lift chair from you? You only pay the price you see on the site plus a small $5.00 handling fee. In most cases, we can actually give you an even lower price than we are allowed to advertise on our website. Will my lift chair recliner arrive fully assembled? All lift chair recliners will arrive fully assembled except for the battery in the battery backup. To enable the battery backup, just insert a 9-volt battery. It's a very simple process. When will my lift chair arrive? The arrival date of your lift chair will vary depending on the model you select and where you live. We have hundreds of chairs in stock and normally ship in-stock chairs in 3 business days. Lift chairs with custom fabrics can take anywhere from 5-20 business days to build and ship. We are more than happy to give you an estimated shipping time when you call us. Shipping is included in the price of our lift chairs for all orders delivered to addresses in the continental US. For orders shipping to Hawaii, Alaska, Canada and other foreign countries, there will be additional freight charges based on actual costs. Please call us for a quote. In order to keep our prices low, we do not have a Medicare claims processing department. However, we will provide you with an invoice for your purchase that you can use when you file with the appropriate agency on your own. For more information on Medicare reimbursement, click here.